Do You Need A Filter For A Fish Tank? The Answer May Surprise You! Do You Need A Filter For A Fish Tank? NO, you don’t NEED a filter. 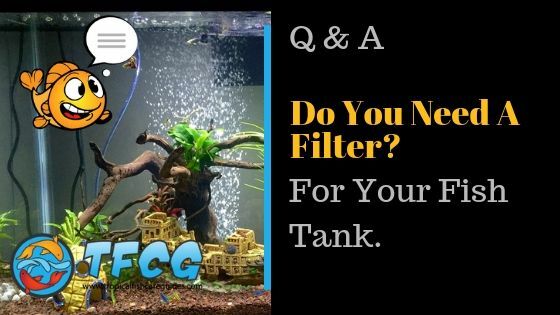 If you have a fish tank or you’re thinking about getting into the fish keeping hobby you may be wondering if you need a filter for your tank? A filter is simply a tool that helps you provide a place to allow the biological filtration to take place. That said, in most cases, you will need to use a filter in your fish tank to provide enough biological filtration. But let’s go a little deeper so you understand what exactly the filter does and why most people recommend filters. The filter keeps the water in your aquarium clean by removing debris and toxins like ammonia, and nitrates. The filter can help oxygenate the water by creating surface agitation. It’s important to understand that ALL aquariums require some form of biological filtration and a filter is the easiest way to provide this. Biological filtration is 100% necessary in any aquarium to help reduce toxins as well as reduce the amount of maintenance required. However, not all healthy fish tanks will require the use of mechanical and chemical filtration. Carbon or any other form of chemical filtration should only be used as needed. Some people (though not recommended) will use a small aquarium, vases & bowls to keep fish. Because of their small size and a small amount of water, it’s very difficult to provide the right filtration and much more frequent water changes will be required, daily in some cases. Is A Filter Necessary For A Fish Tank? As I mentioned above a filter is not necessary to keep a healthy fish tank. But what you do need, is enough biological filtration. Biological filtration helps with cycling the tank, which basically means making the water safe for your fish. It does this by, breaking down waste (ammonia) and converting it into nitrites then further converting it down to nitrates. If you can provide the right amount of biological filtration without the use of a filter, then your fish should be safe. So while a filter is not necessary for your fish tank, you could be limited to the amount and types of fish you will be able to keep. Can Fish Survive Without a Water Filter? There are many types of fish that can do well and survive without a filter. However, all fish will do much MUCH better with proper biological filtration and surface agitation to oxygenate the water which is what a filter will do for your tank. Do You Have To Clean A Fish Tank If It Has A Filter? Even with a filter, it is recommended to clean your fish tank at least once every two weeks. Depending on how heavily you stock your tank and the types of fish you are keeping you may need to clean more often. You should do your best to clean the sides of your tank, to remove algae and use a gravel siphon to remove any built-up debris. At the end of the day it’s our goal as fish keepers to provide a safe healthy environment for our fish. And I don’t know about you but I want to provide that environment as easily as possible. A Filter keeps the water clean and free from toxins, helps oxygenate the water and provides the best place for beneficial bacteria to grow. So while it’s not needed I highly recommend using a filter. By Jack Dempsey|2019-03-12T21:10:17-06:00November 20th, 2018|Fish Tank Filters|Comments Off on Do You Need A Filter For A Fish Tank? The Answer May Surprise You!